The borough of Centralia was a community that once had enough coal to make it a lively, industrial area. It was never a very large community; at its peak the coal mining town was home to 2,761 blue collar people. It was a prosperous town operating its own school district with elementary schools and a high school within its precincts along with two Catholic parochial schools. Centralia once had 5 hotels, 7 churches, 27 saloons, 2 theatres, a bank, a post office, and 14 general and grocery stores. Veins of the richest coal of all, anthracite, the purest and the least common type of coal, ran kilometers deep in the rock over the country side. Coal is combustible sedimentary rock formed from the remains of plant life. The anthracite is used to fuel coal ovens when producing steal. It burns longer and produces more heat than the other grades of coal. It is hard to ignite, but once it is lit it is hard to put out. In the spring of 1962 five volunteer firefighters were burning excess garbage in a landfill behind the Odd Fellows Cemetery—something they did every year before Memorial Day. They unknowingly had picked a spot where anthracite coal was right near the surface and it ignited. The firefighters had put out the fire on the surface, but little did they know, the blaze had burned down a tunnel to the depth of 100 meters to a bunch of abandoned mines. Over the following weeks it rapidly migrated into the surrounding coal mines beneath the town. The Pennsylvania Department of Environmental Resources had begun monitoring the fire. They drilled holes into the earth in an attempt to determine the extent of the fire. In doing so, they later realized the holes had provided the fire with a natural draft that was feeding the coals’ combustion, making the fires even worse. As a precaution the Department had also installed gas monitors in many homes within the affected area. People had started reporting carbon monoxide-related health problems. For four years, all attempts to put out the fire had failed. As the state tried to sort out the cost of putting out the fire and just how they were going to do it, the fire kept getting bigger and bigger. In 1969, seven years after the fire had started, a more involved effort was made to contain the blaze using trenches and clay seals. They had tried digging up the coal around the burn site, but had given up when the fire spread faster than they could dig. The fire kept jumping makeshift fire walls. They tried flooding the tunnels, but there were too many tunnels. In 1979 a gas station owner had lowered a stick into one of his underground tanks to check the fuel level. When he pulled the stick back out, the stick was hot. He then lowered a thermometer down on a string and when he pulled it back out, he found the temperature of the gasoline inside the holding tank was a whopping 172° F (77.8° C)! 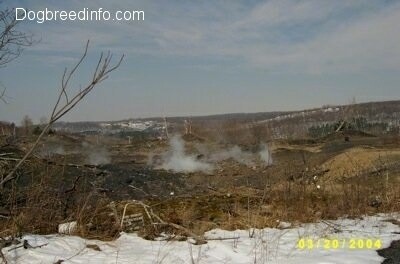 An engineering assessment in the 1980s had said only digging out the entire 3000-acre coal field would put the fire out. This job had the estimated cost of over 600 million dollars, something the state or U.S. government was not willing or able to pay at the time. And so the fire continued to burn with no more plans to try and put it out. After burning underground for almost 20 years, in 1981 a 12-year-old boy named Todd Domboski fell into a sinkhole 4 feet wide by 150 feet (46m) deep. The ground had just opened up under his feet. His cousin saved his life by pulling him from the hole before he plunged all the way down to the hot depths. This brought state-wide attention to the mine fires. At this point about 7 million dollars had been spent trying to put out the fire. In 1984, when years of attempts to put the fire out had failed, and because of the threats of cave-ins, hydrogen explosions, and carbon monoxide, most residences were relocated. Congress allocated more than $42 million to the state of Pennsylvania in an effort to relocate the people who lived within the borough of Centralia. Most of the residents accepted buyout offers and moved to the nearby communities of Ashland and Mount Carmel. This was not a mandatory evacuation and some chose to stay, including the town’s mayor, who was 85 years old as of 2006. On October 29th 2013 State and local officials decided the remaining residents could live out their lives in their homes, after which the rights of their properties would be taken from them by the goverment through eminent domain. Carl Womer, the mayor of Centralia was one of the residents who choose to stay, until his death in 2014. The fire is still burning today beneath about a 400-acre spread. There is enough coal for it to burn for another 250 years, but it is said it may burn itself out in about 100 years. Cave-ins and fractures make the mine impossible to seal off. There are connecting mines in nearby Ashland that are providing oxygen, fueling the fire. No further attempts to put out the fire are planned and most new maps no longer even show Centralia. Gasses and sinkholes make the area an unsafe place to live. The area smells like sulfur (which smells like rotten eggs), which is actually a hydrogen sulfide gas coming off of the burning coal, along with a lot of other gases such as carbon monoxide. Just a foot (12 inches), below the ground’s surface, the temperature reaches 836° F.
Many areas of Centralia experience something called subsidence. This is when the coal seams underground run at an angle. When they burn, the ground above collapses. Anything on the surface can fall into the pits, including trees, people, buildings and cars. This subsidence is what has happened to a portion of Highway 61. The seam over this area of the highway is said to be at an angle of 45 degrees. Highway 61 is the main road coming into Centralia. A section of the highway had to be closed and detoured around due to huge cracks in the asphalt where the road literally cracked in half. Steam and smoke rise up from the ground below. People have been known to burn logs in the cracks just for fun. No need to bring a lighter or match; the logs will begin to burn all on their own. When most of the people had left, the health department lost interest in monitoring the area for a good number of years. 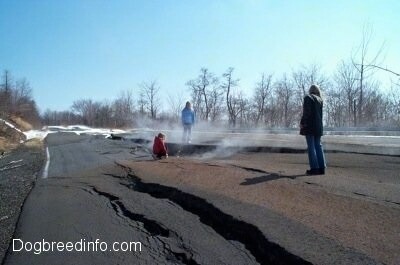 Recently, researchers have started studying Centralia's emissions once again. In the ground, besides the carbon compounds that come with burning fossil fuels, they are finding heavy metals, led, arsenic and uranium naturally occurring due to the fire. Researchers are also looking for signs of life in the smoldering landscape. They are looking for new leaves on tiny organisms and bacteria that may dispose of toxins or treat disease. 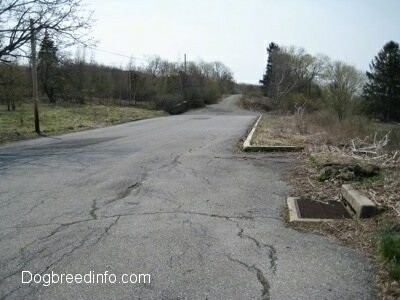 Today Centralia is practically a ghost town. Grass grows over the asphalt of what used to be roads, and fields replace what used to be houses and businesses. Parts of the borough have been reclaimed by plant life, while other parts are smoldering with steaming smoking hillsides, with charred, dead trees lying about. 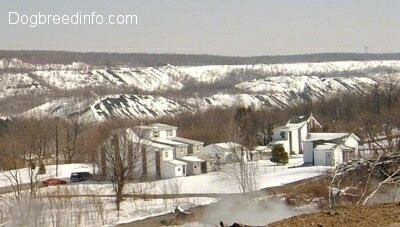 This picture was taken in 2004 of some houses that were still standing in Centralia. 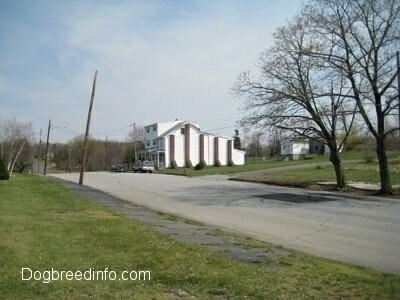 Below is the same street (taken at a different angle) in 2008. 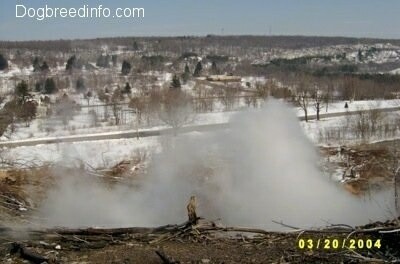 (Pic taken in 2008) Some of the buildings are missing. They were knocked down sometime between March of 2004 and April of 2008. Looking west on Centre Street—see the brick pillars on the side of the house? They are supports because it was once a row home. One by one, they knocked them down. There are two homes left on this street as of 2008, belonging to people who refused to move. 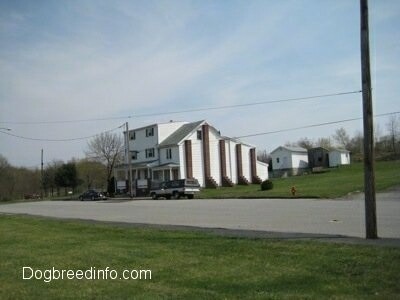 Across the street, where you see the grass, there used to be rows of homes. This is the other end of the same street. As you can see, there are no homes left. 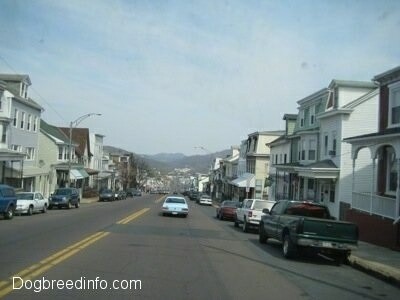 To give you an idea of what these coal towns look like, and what Centralia used to look like...this is a picture of the main street in Ashland, the neighboring coal town. See the rows of homes. 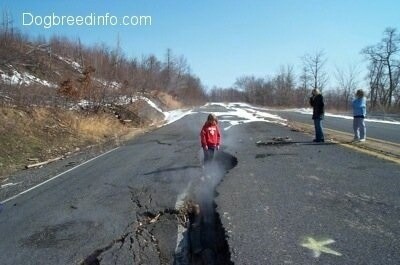 From what people have said, Ashland is similar to what Centralia used to look like. 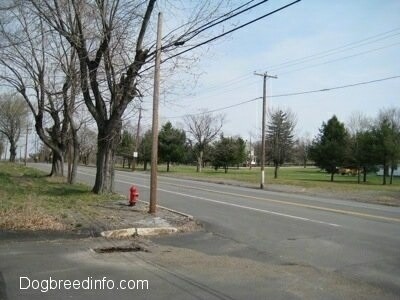 This is the main street in Centralia. It used to look similar to the above pic of Ashland. In 2002, the United States Postal Service revoked Centralia's zip code, 17927. Fire has been burning since 1962. Time capsule buried in 1966 next to veteran’s memorial to be opened in 2016. Fire has enough fuel to burn for 250 years. Fire burns underground for over 400 acres and spreading. In 1992 the state of PA claimed all properties in the borough eminent domain, and condemned all buildings. A lot of newer maps do not show Centralia. Temperatures underground where the coal is burning are about 1,100 - 1,200 degrees F.
Roughly 450 acres are burning.